SketchyPad from Nick Golovin is a handy app for designing mock-ups of Websites and application user interfaces. 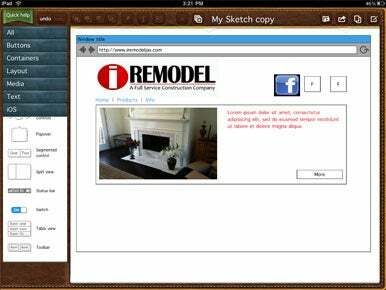 With SketchyPad, you can use your iPad to quickly illustrate a layout or concept for a client or just play around with different ideas you may have. Back to the Drawing Board: SketchyPad lets you illustrate layouts, concepts, and mock-ups on your iPad with the help of stencils and design elements that you can drag onto your sketch. SketchyPad has lots of stencils and user-interface design elements that you can drag into your mock-ups. For Website layouts, the app offers a browser window, text areas, tabs, navigation buttons, and much more. If you’re designing an iPhone or iPad app interface, you can pick from templates of the iPhone or iPad screens, iOS keyboards, navigation buttons, and toolbars, to name a few. Every so often, SketchyPad adds new elements via updates. When you add elements to your mock-up, you can resize them by dragging the control handles surrounding the object. Resizing works well, but there’s no way to maintain the objects aspect ratio as you resize it; elements tended to get stretched or distorted a little when I resized them. The app doesn’t provide a way to rotate elements; however, you can lock elements and rearrange their order to decide which ones are on top. You can adjust the text size, fill color, stroke color and text color on most design elements. You can also import images from the photo library on your iPad and add them a project. Navigating around the screen is a matter of dragging your finger to pan and using the pinch gestures to zoom in and out. This is all fine and good, but most of the time, you end up moving a design element instead of just panning around. It would be better to require a two-finger swipe to pan around the screen. Also, when you pinch to zoom in, SketchyPad zooms from the upper left corner of the screen instead of from when you pinched. It’s a little bit odd that an app aimed at designing user interfaces doesn’t have a great one itself. I often found myself selecting the wrong element or moving an object instead of panning around. I want to emphasize that I don’t think SketchyPad has a poor interface—just one that could be better. Luckily, the developer recently added a generous amount of undos so you don’t have to worry about making mistakes. When you’re done with your creation, you can share it via e-mail as a picture or as an exported Balsamic file. As far as designing Website layouts and interfaces go, SketchyPad gets the job done pretty well. But there are probably better options available for the iPad like iMockups or OmniGraffle, even if they cost a little more than SketchyPad’s $5 price tag.